Alpacas are domesticated animals, originally live and the native to South America. The alpaca is originated in Peru and live nearby the foot of various mountains and high plateaus such as the Andean ranges in Bolivia and the foothill of the Cordillera Occidental. They have also spread to Argentina, Chile, and Ecuador in the South American region. The alpaca (Vicugna pacos) can be found worldwide because they are kept in alpaca farms as a pet for their fleece. The time back, they were domesticated by Indians. The alpacas live in the humid and wet ecology of the North and West Altiplano, while the llamas are found in the cold, dry East and South. Alpacas are also called domesticated versions of vicunas. They are South American ruminants that live in the high alpine areas of the Andes. Alpacas are the members of the Camelidae family and share a lot of the traits of their family members like dromedary camels, Bactrian camels, wild Bactrian camels, llamas, and guanacos. Alpacas are the smallest members of the camel family. They are premier livestock in North America and abroad. To ensure breed purity and a high standard of product produced by alpaca, National Alpaca Registry (ARI) was formed in the year 2014 in the United States. Alpacas often confused with the llama, but the difference between both is the size. They are imported in different countries. Alpacas are smaller than llamas and bred for their fiber, not as a working animal. The number of population of alpaca in Peru is around 3,685,516 as per the Alpaca Culture. Huacaya alpacas are common of the two fleece sort. Their hair is fluffy and crimpy, which looks like that of a teddy bear. The fibre is dense and grows perpendicular to their body the same as like in sheep. They are the robust one between these two species. Huacaya alpacas can live and habitat in the harsh climate of mountain and ground both, so they are easier to keep healthy. The dense and fluffy fleece of Huacaya helps it to perfectly adapt to the rigid climate Andean highlands, where temperature instability can be extreme any time. By their thicker covering of fleece, their adaptation of surviving in higher attitudes of Andes is enhanced. Suri alpacas are the beautiful and humble creature with long shiny locks like very soft, slightly curly hair. This is the more rare species and minor in the population, also the expensive one. They don’t require really thick fleece because of their adaption. Suri alpacas mainly live in places with lower altitude. The both fetch the higher price in the market but, Suri alpaca is relatively more expensive. The fibre of Suri alpaca is generally too slippery to use, so people mix it with cotton, wool or silk. It is 5% of the world’s alpaca population. The difference between both is length and fineness of the wool-like fibre. Alpacas are herbivores, so they eat vegetation. Their diet may comprise leaves wood, bark or stems but grass is the favourite food of alpacas. They will love grazing on grass and munch weeds, shrubs and trees on the ground. With the help of the three-chambered stomach, they can absorb the more nutrients from the food they eat. Alpacas are ruminant, which means they chew cud just like cow and deer and can live and survive in a harsh climate. You can feed alpacas the low protein diet, which is more suitable. The additional supplements can also be fed to the females while they are pregnant. As per the Alpaca Owners Association, alpacas eat 1.5 per cent of their body weight each day. You can feed 60-pound bale of hay to a group of about 20 alpacas for one day. Alpacas have teeth only on the bottom, while on the top they have a hard gum known as a dental pad for crushing grain and grass. Unlike the goats, they don’t have long tongues, with the help of their small tongue; they rip the top portion of the grass and the plants. They have softly padded like feet with two toenails on each foot. Alpacas live in harsh conditions, so they use food efficiently. Alfalfa should be fed occasionally because it contains rich protein contents that are harmful to alpacas. You may consult with the local veterinarian to feed the several manufactured mineral mixes and supplements readily available in the market. They drink a lot of water so they should be provided with access to plenty of fresh water to drink. If you keep them, you have to monitor to ensure they do not consume harmful products. If you want to raise the alpacas you may talk with other alpaca breeders to know from where they get hay. You may feed them pallets throughout the year. It is a great supplement and specifically designed for alpacas. They survive well on different kinds of low protein hay or pasture, providing it has balanced mineral content. Alpacas live in a climate that changes frequently. They graze grass on the ground but that’s not only a healthy diet. In the winters, it’s good to feed them alfalfa pellets, a mixture of corns, oats, and barley is very healthy food for alpacas which they will eat happily. It is mixed with molasses so it makes the mixture tasty for them. You can also add the fibre nutrients in the mixture; it helps to keep their fibre nice, healthy and strong. For fleece producing the animal, fibre is the most important element of their diet because if you process the fibre, it needs to be strong. Providing them direct minerals is add on in keeping their body balanced and healthy. The cost of feeding an alpaca per month is equal to feeding a dog. If alpaca is livestock, they can be bred at any time of year. Alpacas breed only once a year, as they are ruminants, they don’t have the heat cycle. A female alpaca gives birth to only one offspring after the gestation of 11 to 12 months. The newly born baby called cria and can weigh between an average of 15 to 20 pounds. 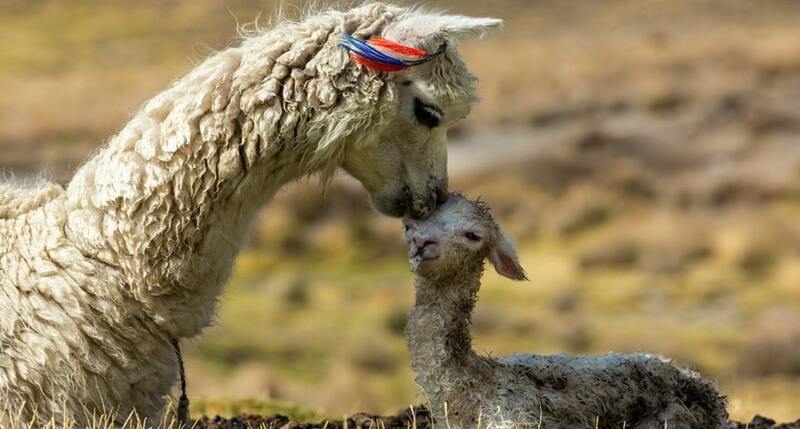 The relationship between the mother alpaca and the child lasts throughout their life. The average weight of an adult alpaca is counted around 125 to 175 pounds and stands 32 to 38 inches at the shoulders. Alpacas are very gentle and friendly, they are not aggressive. They kick and bite very rare but one interesting fact about them, sometimes alpaca do spit at each other just to maintain the space and competing for food. They spit on people rarely, only when scared or amazed. With the little training, alpacas make wonderful pets. Children can handle them easily because of their calm and happy features. South American Indians would keep them previously. Now they are imported worldwide. They are herd animals and their social structure doesn’t allow them to live alone, alpacas live with the herd. If you want to keep alpacas, keeping a single alpaca is will not be a very good idea, an alpaca can die with loneliness. It’s better to keep them in the herd, or if you are just starting, keeping at least 3 alpacas is recommended or preferably 4 is best. They are available for sale also. The cost of young and mature alpaca can be somewhere between $5000 to $15000. Alpacas communicate through humming sound. Tail position and body postures also contribute to communication methods among alpacas. They make high pitched noise while threatened by predators. There is a variety of sound they make like clicks, snorts and humming. But they are best known for their soothing humming sound. The fibre of alpaca is called “The Fiber Of Gods”. Alpacas are adapted to live in a rapidly changing environment. They live in different regions, including Altiplano, the Salar de Uyuni, along with the hydrographic basins of Lake Titicaca and Lake Poopó, the Desaguadero River, temporary lakes, and in a number of valleys. They are found in a number of different colours, It can be around near 22 or more, so a variety of fibre colours is there. The alpaca is shorn once a year and yield around 1.5 to 3 kilograms of fibre. The fibre is marketed majorly to the Australian Alpaca Fleece Limited which is working harder to supply a sufficient alpaca fibre to support the commercial markets in Australia and other countries. The fibre of alpaca is the most natural and light or heavy in weight, depends on how it is spun. This is the most luxurious and silky natural fibre. It is water repellant and difficult to spark. Huacaya grows soft and spongy fibre which is suitable for knitting, besides that, Suri produces the fibre which is better for woven items. The product of alpaca fleece can be simple and indigenous or inexpensive to the very expensive and sophisticated industry made. There are various garments are made by use of the alpaca fleece like hats, mitts, gloves, suits, jumpers, sweaters and scarves are the most common items. In food, the meat of alpacas is so famous towards the world because of its flavoured taste and protein. The meat of alpaca is considered the healthiest and tasty by-product of culling the herd. Each alpaca may harvest 60 pounds of meat. It is nutritionally superior and the red meat which is lower in calories, fat, and cholesterol, so it’s easily digestible. Pingback: What Do Alpacas Eat | The Treat And Diet Of Alpacas.